Adire, the traditional Yoruba textile craft, is finding new life with a new generation. When she was seven years old, Nike Davies-Okundaye lost both her mother and her grandmother. It was left to her great-grandmother—the head of the craftswomen in a village in Ogidi in southwest Nigeria—to bring her up and teach her the craft of adire. Ogidi is one of the major centers of adire production in the entirety of the country. Adire is a resist-dyed fabric which is created by applying wax, string or rubber bands to keep the dye from penetrating the exposed, open areas. Traditionally worn and produced by Yoruba women of southwest Nigeria, adire is a delicate and time-consuming process that can be traced back to the nineteenth century. Primarily a female domestic craft, adire derived from two Yoruba words—adi (to tie) and re (to dye). It’s not unlike the methods used by its hippie-modern sister-fabric known as tie-dye. But unlike it’s psychedelic brethren, producing just five yards of adire is painstaking work and can take up to three weeks or more. 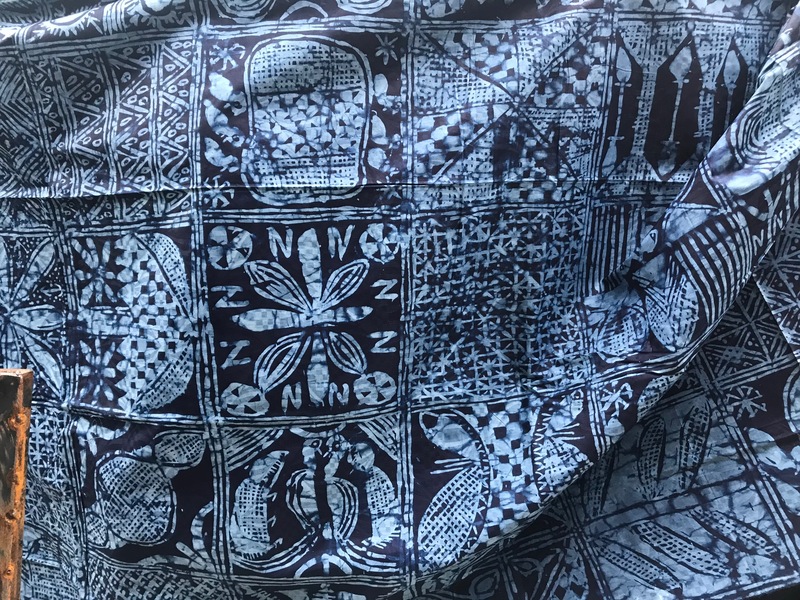 Every day after school, Okundaye’s great-grandmother would teach her how to separate the cotton from the seed, how to make cassava paste—called adire elekois—and using a chicken feather, apply that paste onto the fabric to create the intricate patterns of Adire that are passed down from one generation to the next. Adire was originally produced to make use of old hand-woven materials (kijipa); when a garment or wrapper grew faded, it could be redyed. When the missionaries came to Africa, they brought imported calico and it was used for adire, explains Professor Dele Layiwola in their book, Adire Cloth in Nigeria. These days craftsmen buy (mostly imported) cotton and apply the adire patterns onto the existing fabric. “But no one wants to do it anymore,” sighs Okundaye—now 67 years old—on a sunny weekend afternoon. She is sitting across from me at her gallery, which is located on a peninsula close to the lagoon in the bustling city of Lagos. 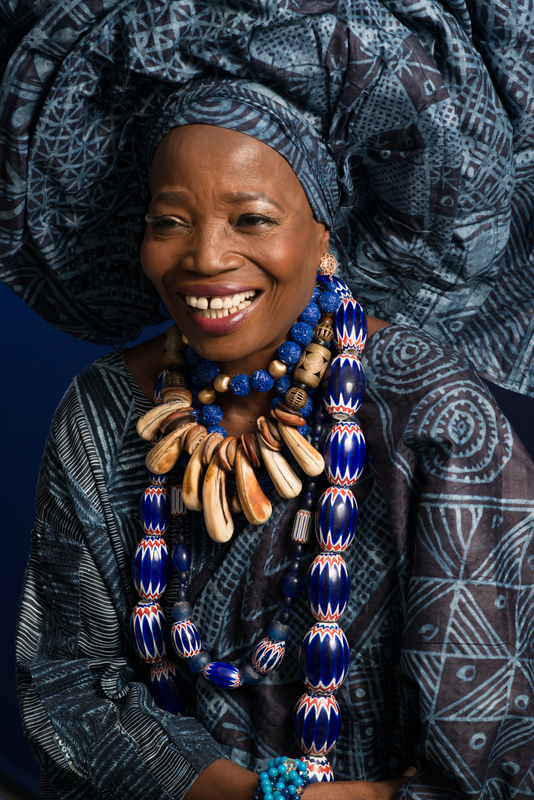 “It’s just too much work and the money is too small.” Hailed as the “Queen of Adire” Okundaye is the most famous proponent of this Nigerian textile tradition, credited for making it known—and celebrated—by the outside world. But despite its creeping popularity in the West, its future remains uncertain. In the afternoons, Nike Art Gallery—West Africa’s largest gallery and a center of Lagos’s buzzy art scene—spreads quietly across four floors, boasting more than 15,000 paintings, sculptures and textiles all crammed together; it’s more a museum than a gallery. But by evening, a steady stream of visitors, tourists, artists, and her protégés come to learn the art of adire from “Mama Nike” and the space thrums with voices and laughter. Weekends at Nike Art Gallery are unique and draw people from all over the city. 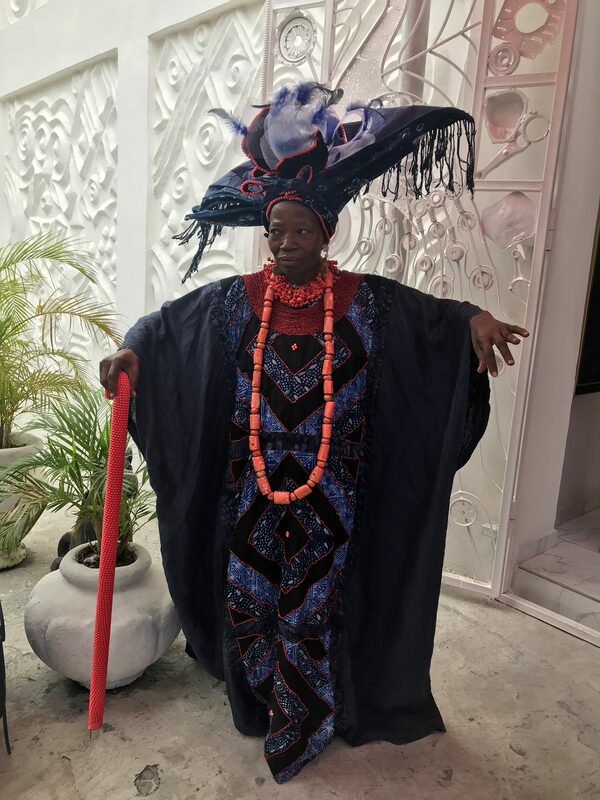 With Mama Nike presiding, young artists from Lagos and surrounding towns share stories of their work over food and drinks; it’s a way of dipping into Nigerian art and culture, with performances of music, dance and masquerades unfolding throughout the evening in the large gallery. Though the history of the craft is difficult to trace, adire—originally prepared only with locally grown indigo—is thought to have started in the 1800s. The tradition of using indigo for dyeing cloth however is thought to be at least a thousand years old in West Africa, according to scholar Jane Barbour whose book from 1971, Adire Cloth in Nigeria, remains an authoritative text on the craft. While adire flourished in the first half of the twentieth century, it started to decline in the 1950s along with Nigeria’s indigenous textile industry, which was wiped out when cheaper imported cloth flooded the market. The decline of adire is often linked to the rise of ankara, the hugely popular, brightly colored wax prints that have come to symbolize African fabric around the world. Ankara has a troubled colonial legacy, and ironically is not African at all. The wax prints came into the African continent from the Netherlands in the nineteenth century, when the Dutch created a mass-produced version of Indonesian batik. These days, cheap copies of ankara are primarily produced in China. Okundaye is warm and energetic, and always dressed head to toe in wrappers and headscarves emblazoned with the exquisite and striking adire patterns created by her own hand. A vital part of her craft she explains, is the sharing of its methods. 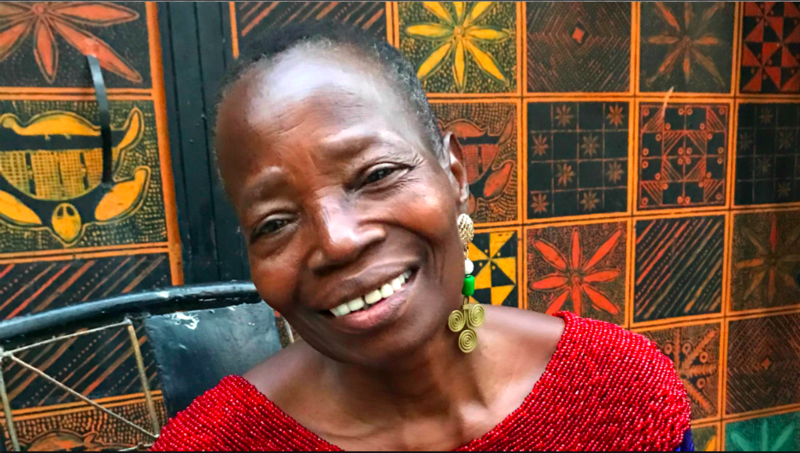 Okundaye has trained thousands of people in the art of adire by holding free community workshops at her art centers in Oshogbo, Ogidi, Abuja and Lagos, for the last two decades. 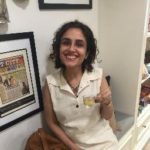 But all of this is not possible, she explains, without creating proper infrastructure to support the industry; the government needs to actively invest in its future. 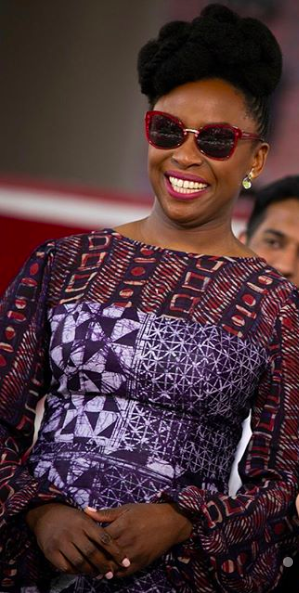 For Adichie, wearing adire is a conscious choice and part and parcel of her activism; she launched “Wear Nigerian” last year to support local designers from her homeland. Until just a few years ago, not many had heard of adire outside of Nigeria, but that’s slowly changing. Today adire is enjoying a coming out moment and boasts global icon enthusiasts including Michelle Obama, Lady Gaga, and Lupita Nyong’o. For a clutch of young Nigerian designers catering to the fashion conscious around the world, adire’s rich history is a compelling selling point to consumers; the craft is indigenous, difficult to produce, rare, and every pattern is a unique form of storytelling. Okuboyejo is of Nigerian-descent and based out of the United States, where he has found a following for his adire-inspired formal and office wear. “A lot of the symbols in adire have meaning and when put together could serve as a platform for storytelling,” he writes me in an email. The patterns in adire are a tapestry of the rich old stories of Yoruba culture, the myths, the history, the folklore, and the rituals. For designers like Okuboyejo and Amaka Osakwe (named “West Africa’s Most Daring Designer” in a New Yorker profile)—her label Maki Oh is entirely inspired by adire and a favorite with celebrities—the fabric represents pride in African and black heritage. She pointed towards her adire paintings.